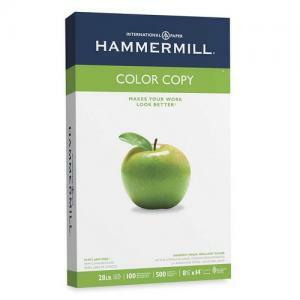 Hammermill 102475 Color Copy Paper - 8.5" x 14"
Color Copy combines an extra smooth surface and high brightness white to produce exceptional color images. This heavy weight sheet was designed to maximize the performance of your customers color copiers and color laser printers while providing their documents with an impressive look and feel. The paper is acid-free for added archival quality that extends the life of the documents. Heavier basis weights enable better color registration and provides a more stable surface for heavier toner applications.